1 cup shredded coconut- Grind to a fine paste and keep aside. 2 guaillo chillies – soaked in hot water. Add both the chana and dad dals. Stir fry till the dals turn a pale golden. Next add the mustard seeds and when they splutter, add the aesofidita. Add the chopped onions and stir fry till slightly golden, next add the ground spice paste. Stir fry for about 5 minutes till oil comes out on the sides. Add the tomatoes and let the gravy cook till the tomatoes disintegrate. Now add the cooked dal,the cooked spinach and 2 cups of hot water. Let it come to a boil. Lower the heat and and let the dal simmer for about 20 to 25 minutes. Just before serving, add the finely ground coconut , boil once. Serve with rice , roti, cooked quinoa or crusty bread. 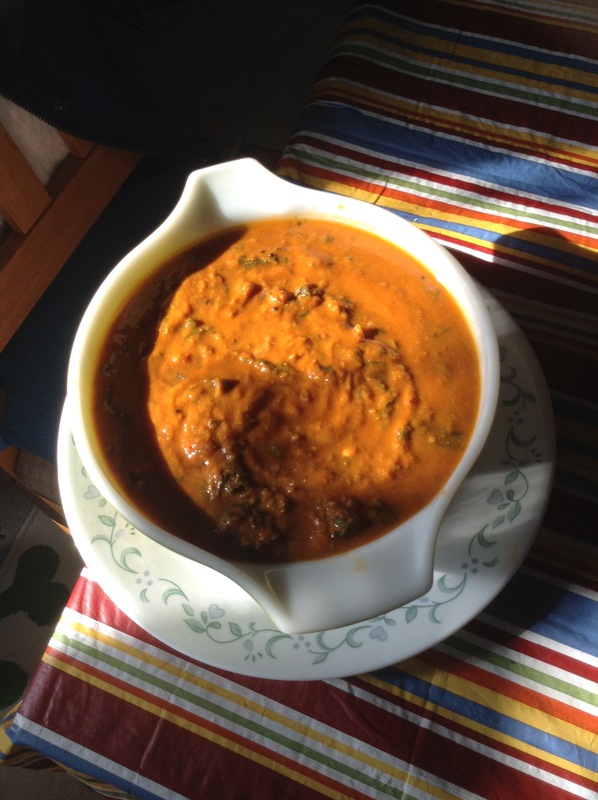 This entry was posted in Uncategorized and tagged Spinach dal. Bookmark the permalink.